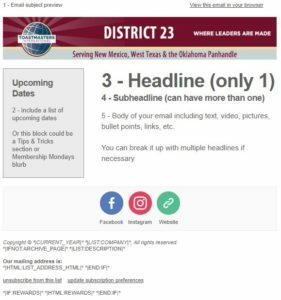 MailChimp is an excellent email blast tool for Toastmasters districts or, really, anyone. I use it for my personal business, I’ve signed clients up for it, and my home district uses it. There are links below to MailChimp and some online tutorials. * Note: If you have a full 2,000 subscribers you can email your entire list up to six times per month. That’s a lot of emails. I don’t recommend emailing your district that often. Once a week is a nice number. In an emergency (like an email blast went out with the wrong information,) you might do a second email blast in a single week. MailChimp allows for full branding within the email tool. 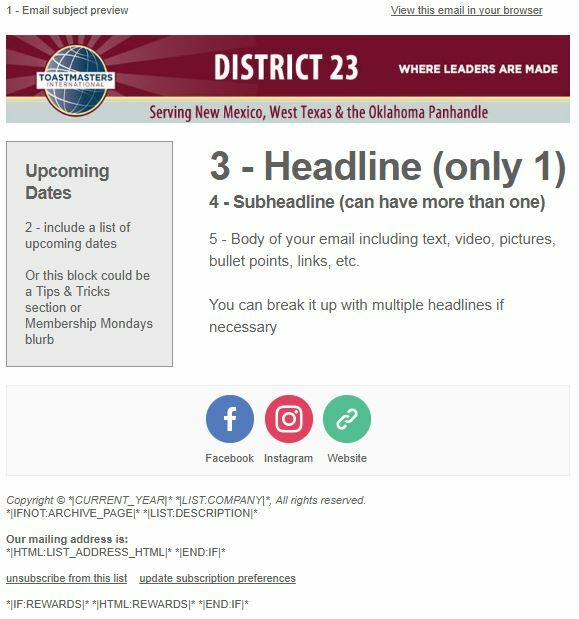 Use the District Email Banner (link below) at the top of your emails for a professional look. Once you have a layout or several that you like, store them as templates and use them over and over so that you do not have to insert the email header, your website link, your Facebook link, and other items that will consistently show up in every email. The reports are very useful for seeing how your content is doing and if you need to tweak it.